Indiana Tower was installed as part of the construction of the Kenwood and Stock Yards branches, which were completed in 1907 and 1908, respectively. The tower, located at the east end of the inbound platform of Indiana station, controlled the convergence of the three-track South Side main line with the two branches. Although mainly north-south in alignment, the South Side main line takes a turn at 40th Street which moves the right-of-way from between State and Wabash north of 40th Street to between Calumet and Prairie south of 40th, resulting in a four-block section that runs east-west. Along this east-west section is Indiana station, originally just one of several local stations along the line. 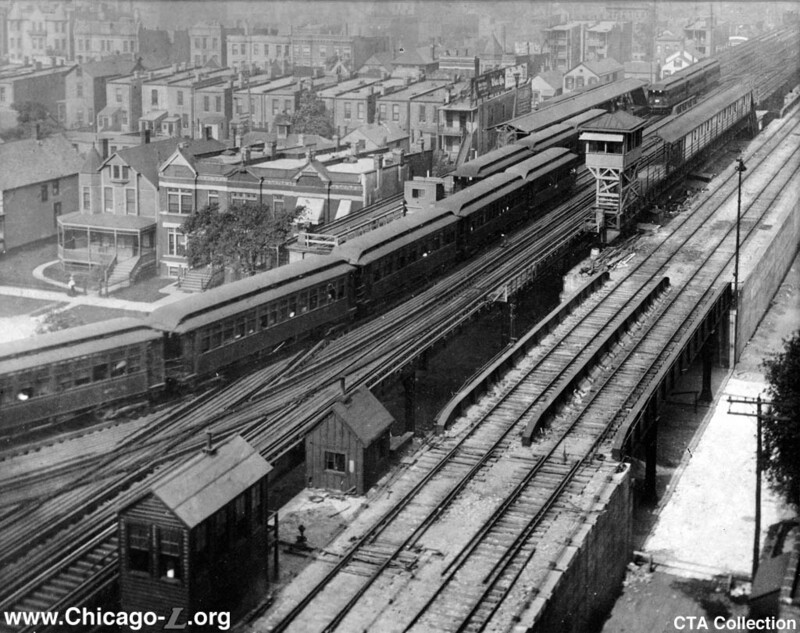 On September 30, 1903, the Chicago Junction Railroad and the South Side Elevated signed a 50-year lease, with options for two 50-year renewals and an option to buy, for the CJRR to built two "L" branches along its right-of-way and for the "L" company to operate them. The Kenwood branch projected east from where the east-west mainline turned back south, while the Stock Yards branch continued west from where the mainline turned north. 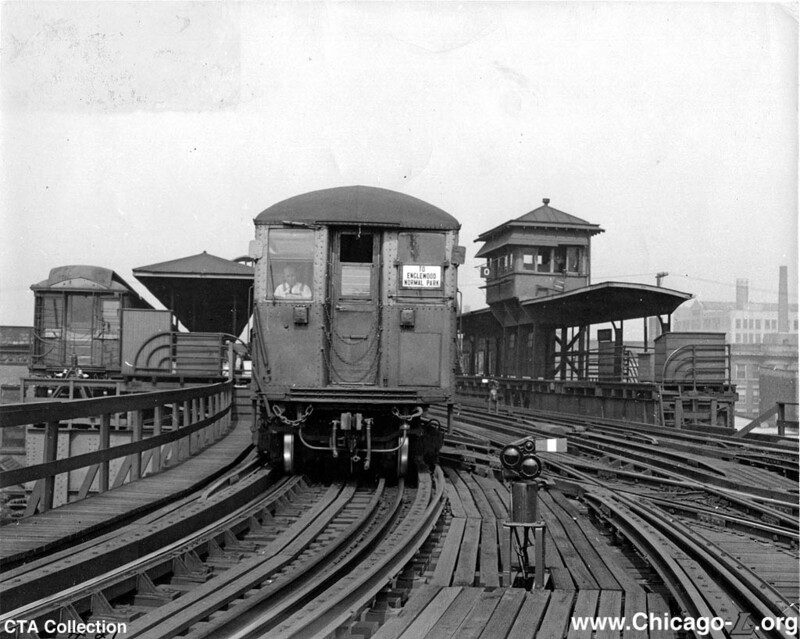 Indiana station became a transfer station, and a new interlocking tower was built to control the complex of interlocked switches. The mainline was three tracks -- two local tracks outside with an express track in the center with service operated in the peak direction of travel -- with the third track having only recently been completed in 1907. The Indiana platforms were on the outsides of the local tracks. The two track Kenwood branch entered the junction from the east, with the two branch tracks connecting to the two local mainline tracks. The Indiana station platforms were immediately west of this junction. The two-track Stock Yards branch approached the mainline tracks where the latter curved east at 40th Street and Wabash, then ran -- but did not connect with -- the mainline tracks, parallel and adjacent to the south of them. After about a block and a half of running parallel, a complex of interlocked switches connected the three mainline tracks with the two Stock Yards tracks. 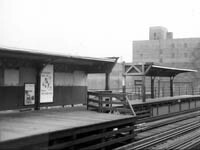 East of the interlocking, the Stock Yards tracks converged into a single stub track, which terminated along the south side of the outbound Indiana platform, converted it into an island platform. 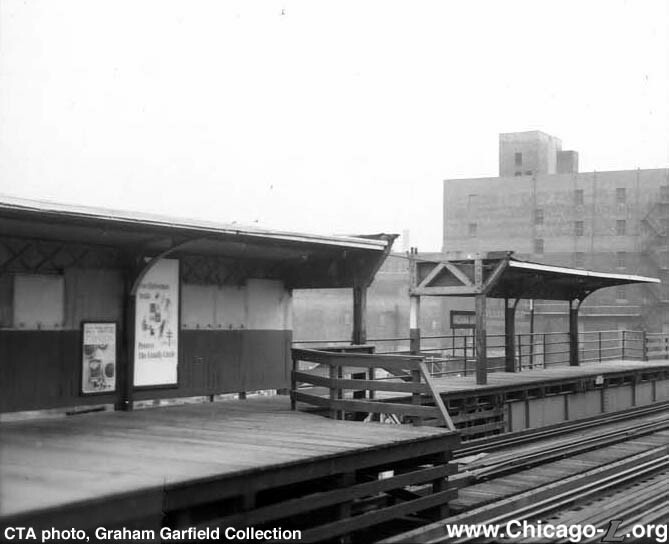 The interlocking tower was originally at the far east end of the inbound platform, beyond the platform canopy. The tower was elevated above the canopy, providing a birds-eye view of the complex of switches west of the station, as well as the junction immediately to the east. In normal operation, the Stock Yards trains ran as shuttles to and from Indiana, stubbing in and out of the single-track pocket on the south side of the outbound platform. 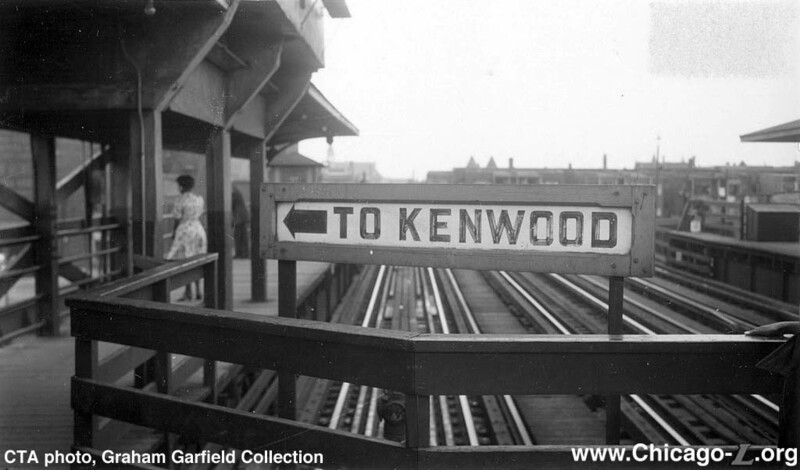 Kenwood trains ran a more complex operation, with Indiana-Kenwood shuttles alternated with through trains between the Loop and the Kenwood branch. There were some other service patterns run over the years, however, including Kenwood-Stock Yards trains and Stock Yards-Jackson Park trains. 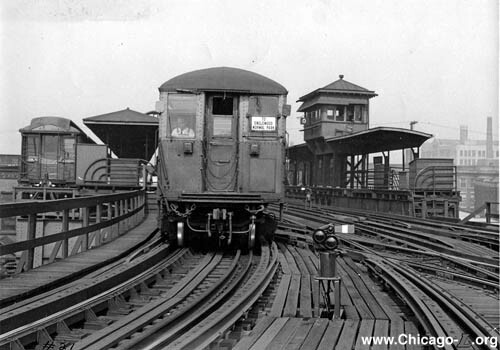 Circa 1913, an overhead bridge was added to the east end of the station platforms to allow passengers to transfer between them. Around the same time, the station platforms were renovated, with the canopies replaced and extended, including around and beyond the tower. 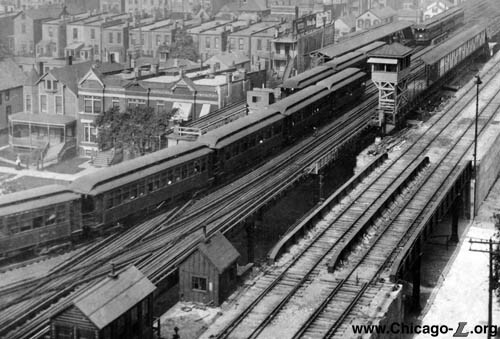 On July 31, 1949, the CTA instituted its North-South Route service revision, which turned the Kenwood and Stock Yards trains into shuttles to Indiana, with all through-services discontinued. The operation of express trains on the mainline was discontinued, replaced with A/B skip-stop service during heavy ridership periods. As a result, one of the three tracks was removed from service on the mainline. West and north of Indiana station, the center track was removed from regular service, although it was kept operable for a number of years. Though Indiana station and south to 43rd (where the tracks converged from three to two), the former northbound local track was removed from regular service, with northbound trains using the former bidirectional express center track. The northbound track was removed through Indiana station, with the inbound station platform widened across the former local trackway to serve the center track now used by northbound North-South trains. The former northbound local track terminated at the east end of the northbound platform, underneath the tower and just east of the transfer bridge. This left a bit of the platform still alongside the track, with the platform extended a bit farther east, essentially forming a narrow dog-leg extension off the east end of the wider platform. Kenwood shuttles stubbed in and out of this pocket. The tracks were reconfigured such the two Kenwood tracks merged east of the junction using a spring-and-return switch which allowed inbound shuttle trains to trail through the switch into the pocket at Indiana, with the switch automatically realigning itself for the turnout, routing shuttle trains onto the outbound track upon their return. The switch connecting the former northbound local track may have remained interlocked but was rarely used, except perhaps for equipment moves. The only connection between this track and the mainline was a hand-operated switched where they merged at 43rd Street. The Stock Yards stub was similarly reworked, with a spring-and-return switch located east of the platform. A single left-hand switch connected the outbound Stock Yards track with the mainline, and a complex set of switches remained west of the station, though they too were now rarely used in regular service. The tower seems to have remained, however, to work the interlocked switches as needed. On October 6, 1957, all Stock Yards service was discontinued. This was followed by the suspension of all Kenwood service on November 30, 1957. A week earlier, on November 22, 1957, Indiana interlocking was removed from service. The Kenwood and Stock Yards tracks were quickly removed, along with all switches associated with them. The switches that remained west of the station -- a universal crossover immediately west of the platforms and a set of switches between the two local tracks and the unused center track -- were all converted to hand-throw switches. The former northbound local track between 43rd Crossover and Indiana remained, though not used for any regular service, until it was removed from service on July 20, 1966. The tower was demolished by 1961, but was more than likely removed soon after the interlocking was removed from service. On December 1, 1971, operation of an expanded block signal system began in vicinity of Indiana station. On February 23, 1988, Indiana crossover was removed from service. Today, there are no switches in the vicinity of Indiana station.